IAMBRIGITTE : Something New: The SM Beauty Box! Something New: The SM Beauty Box! And when I say huge, I really mean HUGE! Unlike any other beauty boxes out there, this one's not a subscription box. This box is available at the SM Store Beauty sections in SM Makati, SM Megamall, SM Mall of Asia and SM North Edsa for a limited run starting today! If you frequent Watsons (like me!) and is a certified Watsons-junkie (like me, again!) you'll definitely love this box. It contains a bevy of beauty must-haves, both for physical beauty and for inner allure. While some of the products included in the package are primping and preening essentials, others take personal care to a new level by promoting skin and general health. And the best part? 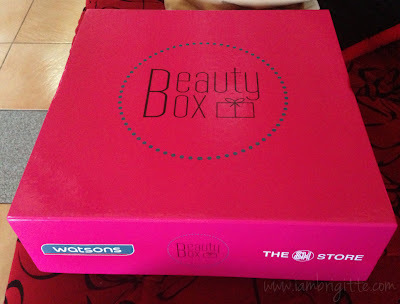 You only need to pay Php799 for a box with a whooping Php4000-worth of products! Palty Hair Color in Namachoco Waffle. I've heard a lot of good things about this and it makes me so happy to see it in this box. I wanna try it but having a much complicated hairstyle like I have now makes me think to just leave it to the experts. I'll have Mom try this instead and I'm pretty sure she'll love it! I've tried a gugo shampoo before and didn't like how it made my hair so hard to comb. I want my hair to feel soft, who doesn't!? So let's see if this baby would change my mind. These babies are easy-to-use and easy-to-carry beauty essentials that won't take too much space on your bag when you travel. I am actually bringing these when I leave soon..sob! I love the citrus-y scent and how it makes my hand feel smooth and looking younger. I'm a sucker for hand creams so this baby goes right to my makeup kit! I have a lot of calluses (no thanks to those closed, sky-high pumps) so I'll be giving this a try. This one reminds me of Cetaphil. Will try this soon to know if it works just the same. The last two are a proof that this box isn't just all about physical beauty but overall well-being. So there you go...do check it out and I tell you, this box is really worth it. I'm sure you'll get at least one, or two (or more) that you'd really like. That's a lot! I am going over to Watsons (right now) to check it out haha We have Watsons downstairs! Hi! Is this sponsored? Is every box the same or random talaga per box? I'm excited to try this but Im afraid the box i'll get isn't as good as yours :( Thanks!